Ultrasound QC requirements are on the increase. Hospital infection rates are a TJC Top 5 issue, and annual transducer QC failure rates are high. Yet many facilities still track QC in log books and spreadsheets. 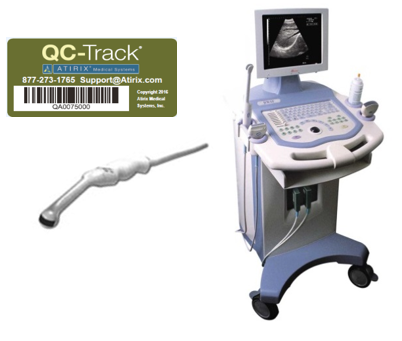 For ultrasound QC, QC-Track offers a base unit and loaner replacement workflow and two optional transducer QC workflows for a complete US QC solution. Scheduled workflows with checklists help ensure all aspects of the ultrasound base system -- including filters, cleanliness, and mechanics -- are functioning properly. Checklist and Device Worksheet reports facilitate oversight and management of ongoing QC. Barcode tags are applied to base units and transducers. Worksheets capture all phantom data and calculate a pass/fail. HLD workflow meets TJC requirements for traceability of HLD performed on semi-critical devices, such as invasive probes, as well as other probes that come in contact with non-intact skin. Barcode tags are applied to transducers and HLD units. A QC-Track record ID is generated for each HLD cycle for RIS/HIS/EHR tracking by exam. HLD cleaning self-test failures and disinfection indicator fails can also be recorded and reported. Transducer and HLD unit cleaning history reports can be easily generated. HLD loaner replacement workflow allows for seamless QC tracking while units are being serviced. Advanced Search page for centralized infection research quickly isolates transducer and HLD unit history. Simplify ongoing tracking with automated QC status monitoring and built-in email notices, including reminder schedules for each tracked transducer. Reduce unmanaged PHI by eliminating unsecured paper HLD exam tracking books in cleaning labs and exam rooms. Standard QC-Track Sign Off is available for the Ultrasound workflow for capturing the ACR-required annual medical physicist sign off on the on-going QC. The QC-Track US module is an optional add-on to the QC-Track Base Platform. Standard US Base Unit QC is licensed by imaging unit and location. Optional Transducer QC and traceability is licensed by transducer and includes Barcode Tags for transducers, base units and HLD cleaning systems. The ACR Continuous Quality Control (CQC) program specifies tests and frequencies within their ACR Ultrasound Accreditation Program Requirements. See ACR Ultrasound Accreditation Page for more information. For Breast Ultrasound, see ACR Breast Ultrasound Accreditation Program Requirements or ACR Breast Ultrasound Accreditation Page.